According to a World Bank Report, the world generates an average of 3.5 million tons of solid waste per day. Furthermore, daily waste is expected to climb to 6 million tons per day by 2025. The World Economic Forum reports that 84 percent of material inputs are lost to landfill or incineration annually, representing a loss of $2.7 trillion in potentially valuable materials. According to the U.N.’s Food and Agriculture Organization, one third of the food produced in the world for human consumption every year gets lost or wasted. That’s 1.3 billion tons of food. As the world’s largest grocer, we are committed to reducing food waste from farm to fork, including food waste within our operations. 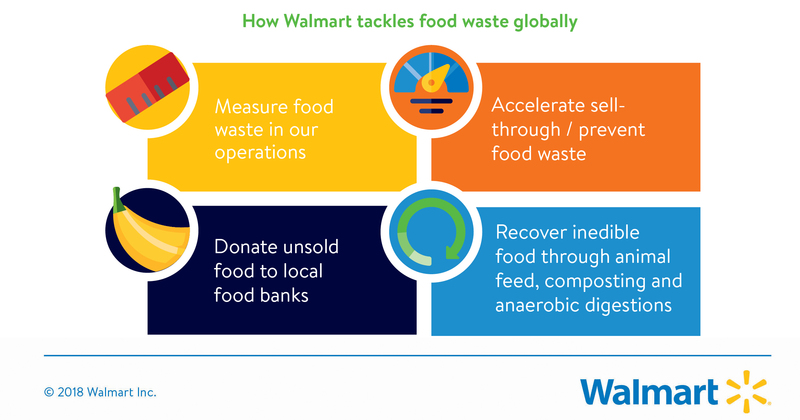 Walmart is aiming for Zero Waste* in our operations in Canada, Japan, the U.K. and the U.S. which means we intend to go beyond the United Nations Sustainable Development Goal Target 12.3 and Consumer Goods Forum Food Waste Resolution. In fact, Walmart’s operations in the U.K. (Asda) achieved zero food waste to landfill and combustion without energy recovery in 2016, the baseline year. Asda is a signatory of Courtauld 2025, a commitment to reduce food waste by 20 percent by 2025 and double the amount of food and drink redistributed by 2020 in the U.K. Asda aims to reduce the amount of food waste sent to incineration with energy recovery by 50 percent by 2020. * Meeting or exceeding Zero Waste International Alliance business recognition program requirements, which include adoption of ZWIA definition of Zero Waste and achievement of 90 percent or more diversion of all discarded resources from landfills, incinerators and the environment. Accelerating sell-through. The primary way we seek to reduce food waste in our operations is by actually selling the food we carry. We have improved our forecasting and ordering tools to improve inventory, adjusted store fixtures to increase turnover and consumer appeal, and provided our store associates with tools and education on how to better care for food and manage it at the end of shelf life. In Canada, China, Japan, the U.K and the U.S. we offer customers discounts on food that is close to its expiration date, including meat, bakery, dry goods and dairy. In FY2018 we sold more than 262 million units through these programs in the U.S., saving our customers money and helping prevent food waste. Donating unsold food to people in need. 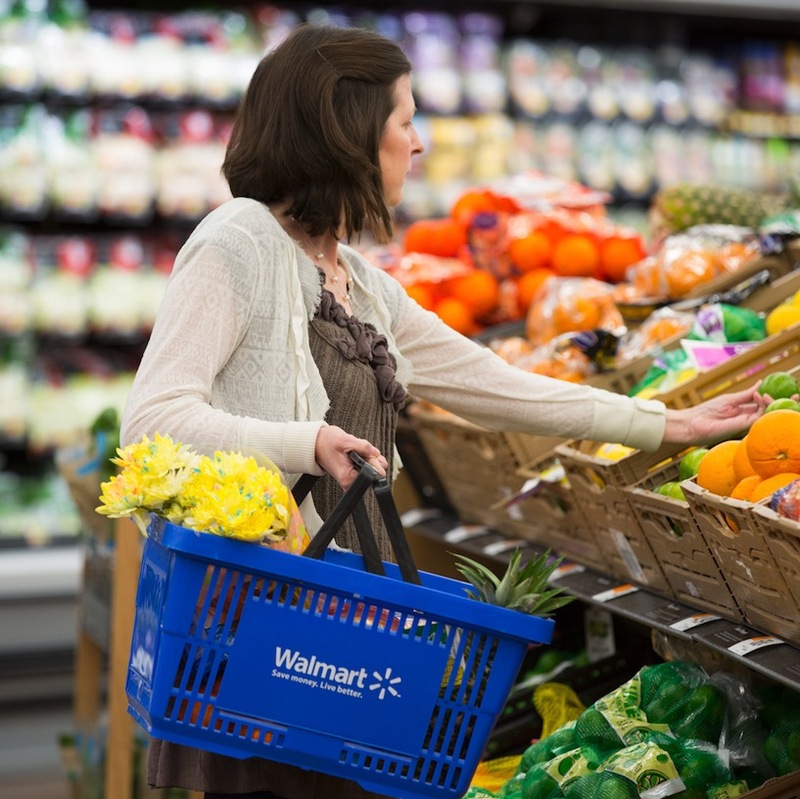 When food goes unpurchased, Walmart works to maximize its use by getting it to people and places that need it. Because we aspire to system-level change, we have also donated funds to purchase equipment, such as refrigerated trucks, to increase the capacity of the charitable meal system to transport and deliver fresh food, whether it comes from Walmart or elsewhere. This helps people in need, but also strengthens the broader waste-management ecosystem by reducing the amount of food that is sent to landfills. In 2017 our stores, clubs and distribution centers in our U.S. and international markets have donated 755 million pounds of food to organizations that distribute it to people in need. This is equivalent to 628 million meals donated globally—562 million meals in U.S. and 66 million meals internationally. Recovering inedible food. If food is no longer edible, we strive to convert it into animal feed, compost or energy. Examples include Japan, where we recycle 100 percent of fish traces and bones left after meals production. In Mexico, we expanded a program for collecting inedible fruits, vegetables and bakery goods for composting, diverting 4.8 tons of waste in our supercenter stores and Sam’s Club locations in 2017. Our Asda stores in the U.K. are recycling food into energy by taking inedible unsold food to anaerobic digestion plants, where it is broken down into gases that can be used as fuel and fertilizers. In Guatemala, we piloted an aerobic biodigester in a supercenter for food waste reduction. Walmart Japan stores sell a variety of fresh fish and prepared meals with seafood. They have partnered with recycling vendors throughout Japan to recycle fish traces from meal preparation and fish waste into commercial products such as pet food raw material. The collected fish waste is recycled on the same day. In 2017, we recycled 1.1 million pounds of fish waste through this program.